The record-setting storm that blasted the Plains states a couple of weeks ago set an all-time high wind gust at the airport in Colorado Springs. The airport's gauge recorded a 96 MPH gust during the height of the storm, which is an incredible feat to accomplish outside of a severe thunderstorm or a landfalling tropical system. 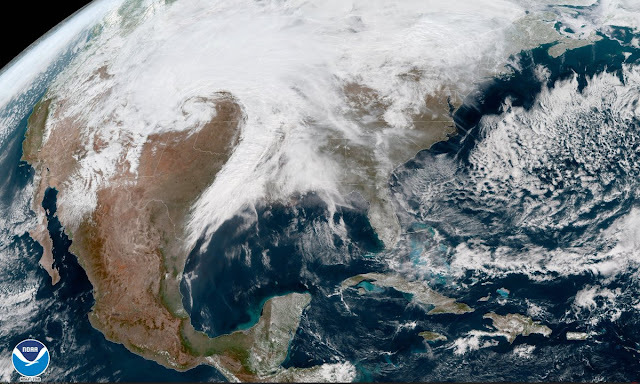 The record wind gust came during the "bomb cyclone" that plagued the Plains states earlier this month. The storm, which underwent bombogenesis by rapidly strengthening over the course of one day (hence the name), set numerous all-time record low air pressure readings as it wound up across southeastern Colorado and western Kansas. One of the nasty side effects of such a strong storm developing over such flat land is that it produce roaring winds across an enormous stretch of land from the southern Plains to the Upper Midwest. Many locations reported sustained winds greater than 50 MPH and gusts well above 70 MPH. Communities near the center of the low saw the strongest wind gusts. Intense winds managed to destroy a home in Yoder, Colorado, located a few dozen miles east of Colorado Springs. The home exposed to the full force of the winds roaring over open fields without any trees, terrain, or other buildings to act as a buffer.